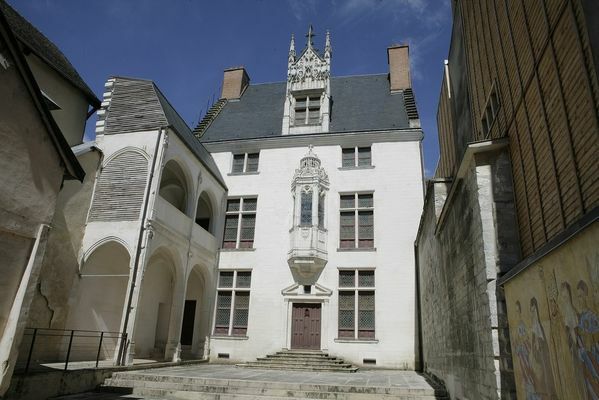 This Renaissance-style hôtel has since the 15th century belonged to a large Troyes family of drapers, the Jouvenels, who were ennobled as Juvénal des Ursins. Moreover, the rue Champeaux called the used to be rue de la Draperie. Jean Jouvenel or Juvénal (circa 1360), a judge, was the prévôt (provost) of the Paris merchants. His son Jean, Archbishop of Reims, took part in the review of the trial of Joan of Arc, and Guillaume, another of his sons, was chancellor of the French Kings Charles VII and then Louis XI. A third son, Jacques, who died in 1445, was a patron of the famous and richly illustrated manuscript of miniatures, the Mare historiarum, by Giovanni Colonna (kept at the Bibliothèque Nationale de France). The hôtel was rebuilt in white stone after the great fire of 1524. The façade, with its large moulded mullions, is decorated in a threesided Gothic-style oriel window, topped by a fine, open-sculpted turret, which was restored in the 17th century. The interior stained glass represents the donors and The Crucifixion. The roof has a large Gothic 15th century dormer window taken from an earlier building.